AMARI KOH SAMUI INVITES DINERS TO WELCOME THE YEAR OF THE DOG WITH A SUMPTUOUS BBQ AND SEAFOOD BUFFET ALONGSIDE SOME AUSPICIOUS DISHES! Chinese New Year is the holiday that brings all family members together and food is the cornerstone of the celebrations. 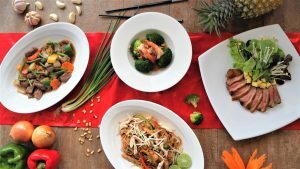 Amari Koh Samui invites hotel guests and Koh Samui residents to partake in the joy of Chinese New Year with a feast of Chinese auspicious dishes as well as a special BBQ and Seafood Buffet, including a live band playing all-time favourites and a popular fire dance show on 16 February 2018 at Amaya Food Gallery. The buffet is from 19:00 to 22:00 with the lucky number price of 988*THB. Those who want to celebrate all month long can order special à la carte dishes every day at Amaya Food Gallery. The prices of special dishes range from 320 to 1,600* THB (*these prices are subject to 10% service charge and 7% VAT). For reservations, please contact Amaya Food Gallery at +66 (0) 77 300 306 – 9.